that promise the world to me. They never do their job. I love all things sparkly. and I like my peace and quite to include some sparkly cleanliness. 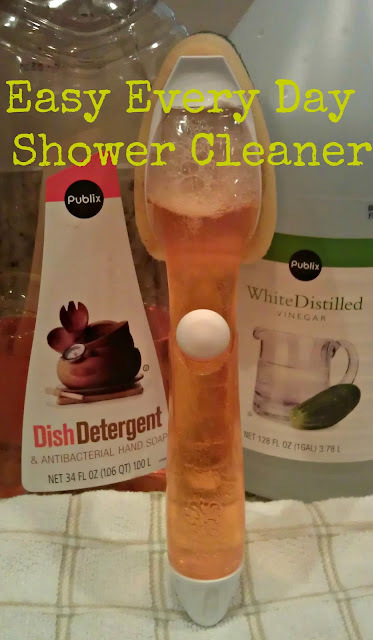 This might just be the easiest shower cleaner there is. And it gets the job done. Fill the scrubber with half dish soap and half vinegar. Give your shower a daily scrub down while you are in there. You have a clean shower. I really need to try this. I hate having to scrub and scrub every time I clean the shower. Oh I will give this a try!! I am going to give this a try! Thanks! I have GOT to give this a try!! I especially love that you mention it's the one place you can find peace and quiet. that's so true.. so sad. LOL ;) Love this! I've been using this combo too and love it! I never thought about doing it daily though. Perfect! I love this idea! I know what you mean about peace and quiet in the shower, I'm totally going to do this. It will give me an excuse to stay in there longer (at least a better excuse than just standing there naked with my eyes closed). Sorry, TMI, definitely new follower.